On an island blessed with over 250 dining establishments, only a handful stand out. 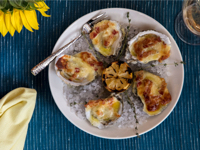 Alexander’s, located mid-island in Palmetto Dunes Oceanfront Resort, is one of those few and has been on the tips of tongues since 1977—a favorite among Hilton Head Islanders and visitors alike. So, you can imagine the dismay when a recent headline pronounced this iconic restaurant closed forever. But forever didn’t last long. Now under direct ownership and management of the resort, open for business in its familiar lagoon-front setting, Alexander’s is poised to surprise and delight with updated Lowcountry décor accented with paintings from local artists and a menu that is both a nod to the past and a step into the future of culinary excellence. 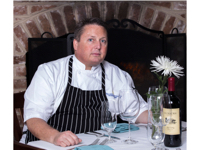 When Palmetto Dunes Resort’s executive chef Don Reinheardt was charged with reimagining the menu at Alexander’s, he took a judicious approach. With respect to the restaurant’s past, he kept perennial favorites such as crab-stuffed flounder, shrimp and grits, and wiener schnitzel, while refreshing the offerings to reflect his own vision and a slightly new direction. “We took the menu that has been popular and successful throughout the history of the restaurant and then looked at ways to polish it and build upon it,” Reinheardt said. In collaboration with Sean Carroll, the talented new chef de cuisine from Williamsburg, Va., he has masterminded a bill of fare, perfectly blending the tried-and-true with fresh additions sure to please die-hard fans as well as newcomers to the restaurant. 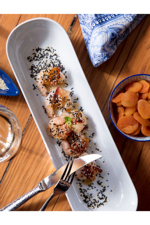 Grilled and glazed with apricot and sesame seeds. Past patrons can expect to see familiar faces, as many longstanding employees are returning to the fold. “We’re very happy to have a lot of the past staff join our team, because they know the guests. It’s a friendly face at the door, and it’s nice to have their input during this transition,” Couey said. Adding to the fun and functionality of the space is a new stand-up bar alongside the existing bar, so that guests have more space to enjoy pre-dinner cocktails and conversation. Kaitlin Reed, beverage manager for Alexander’s, has been hard at work developing a selection of specialty cocktails and finalizing the wine list, which includes a variety of domestic favorites as well as international labels that people enjoy. Additional perks include an electronic message board at the hostess stand to inform guests of recreational opportunities and resort activities, and several outlets in the dining room that include USB ports for charging personal devices—small details that add value to the overall guest experience. “It is about food and beverage, but it’s also about hospitality,” Couey said of the improved features, modern touches and local flavor. Topped with horseradish cheddar, crab and bacon. 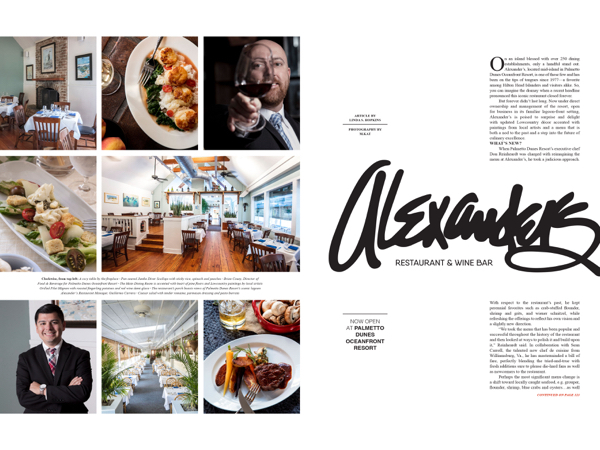 Alexander’s distinguishes itself as an upscale seafood restaurant and wine bar, avoiding the term fine dining, which some people may perceive as stuffy or ostentatious, Couey said. The goal is to be a place where guests can unwind from a day of work or play—enjoy delicious food and friendly, attentive service in a relaxing atmosphere. Alexander’s is located at 76 Queen’s Folly Road (the main entry road to Palmetto Dunes Oceanfront Resort) on Hilton Head Island. The restaurant is open for dinner and early dining at 5PM seven nights a week. For more information and reservations, visit alexandersrestaurant.com. Reservations are suggested and are available on the website, or by calling (843) 785-4999. Call (843) 785-4999 or reserve online at alexandersrestaurant.com.